Start with a Question: You're Going to #GoOpen. What's Next? You're Going to #GoOpen. What's Next? The U.S. Department of Education's Open Education initiative, also know as #GoOpen, came to New England for a summit hosted by Dr. Daniel Downs from North Reading Public Schools at the Amazon offices in Cambridge, Massachusetts today. Leaders like Kristina Peters, Andrew Marcinek, and Grace Magley spoke, and I was honored to be asked to speak about how openly licensed resources and tools can be used to help create high quality learning experiences for our students. All students deserve great teachers, and great teachers deserve access to the resources they need to customize learning experiences for their students. But once they have access, what's next? How can we motivate students to want to read and learn deeper with these resources? We have to start by inspiring them with great questions. These questions shouldn't be based on standards, rather they should inspire our students to want to master the content and skills in the standards. There are examples of inspiring questions in the lessons highlighted in the slide deck below. If teachers are looking for help crafting these inspiring questions, ASCD's resource on essential questions is a great place to start. What do classrooms look like when these tools and resources are being used well? Learners need spaces that allow them to share, move, be quiet or loud, and create. Traditional classrooms encourage obedience, but obedient students are not necessarily learning. Included in the slide deck below are photos of creative uses of spaces in schools I've worked in for the past few years. Check out this brief interview where I talk about how to redesign your classroom, even if you have no budget, by involving your students. There is a lot out there! 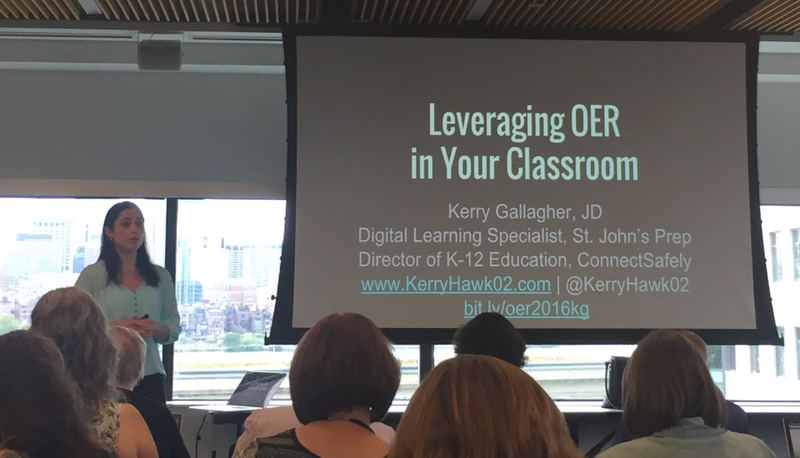 What is the best OER to help teachers get started? There are search tools, like OER Commons, Edmodo, and Follett Destiny. But what if you are just starting to look into OER and wading through the search results feels a bit overwhelming? 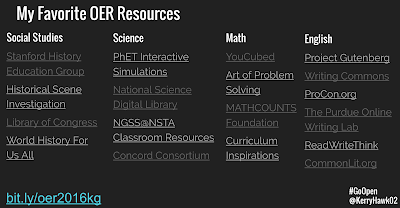 I've put together a list of my top 4-5 OER sources in four content areas. The names are hyperlinked in the 3rd to last slide on the deck embedded below. Or just Google the names of the sites listed on the graphic. What tools should teachers use to gather OER and then distribute them to their students? First an foremost, if your school has an learning management system (LMS) take advantage of that powerful platform to curate resources, distribute them to students, and to give and receive feedback from students as they are learning. If your school doesn't have an LMS, create a class website or blog that can be a central place students and parents know to find everything they need for your class. Post links to the OER you plan to use there. If you aren't ready to create a class website, one platform that is cleanly designed and works well on a browser or as an app is TES Teach. It is an easy free tool. There is even an example of a middle school math teacher who uses it well in the slide deck. Here is his lesson. How can we protect our students' data privacy when using so many digital tools and resources? Classroom educators as a group are not receiving enough information or training about how work they do with digital tools every day in their classrooms can effect their students' data privacy. The Educators Guide to Student Data Privacy was created with that audience in mind. It is a great resource for school or district leadership looking for ways to talk to teachers about this important topic. When it comes to evaluating tools, if the company who created the tool or resource you're thinking of using has signed the Student Data Privacy Pledge you are probably in good shape. Simply communicate your concerns and goals with the company and you will likely be ready to go. For more detail on each of the answers, please do check out the slide deck. 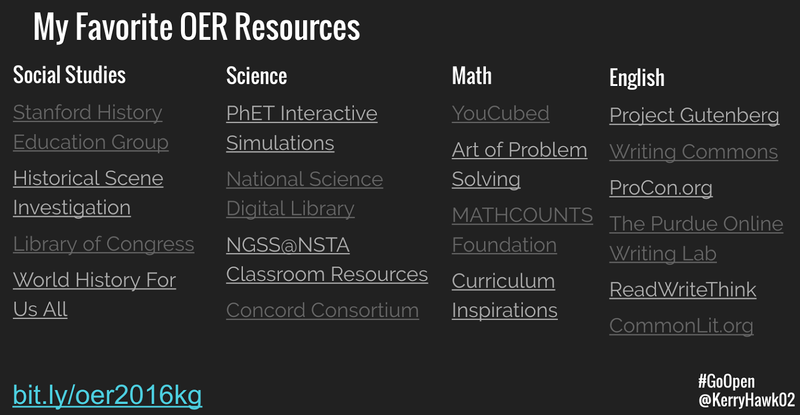 There are lots of photos, lesson examples, and links to resources to help any school or teacher who is thinking of making the move to OER.